This time of year can get messy! With lots of baking, decorating and crafting going on before your guests arrive, it’s always a good idea to stock up on essentials like paper towels and toilet paper during the holidays. That’s why Charmin and Bounty are both $3 off any variety at Sam’s Club and SamsClub.com until December 25th. It’s their gift to you, because everyone can use a little more green in their wallet! 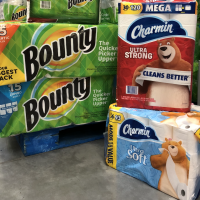 This is a sponsored post written by me on behalf of P&G at Sam’s Club. All opinions are 100% mine.